Plum wine with red chili peppers. Wasabi-flavored smoked cheese. Shredded yuzu peel. Potatofu nuggets. Luxury sake. 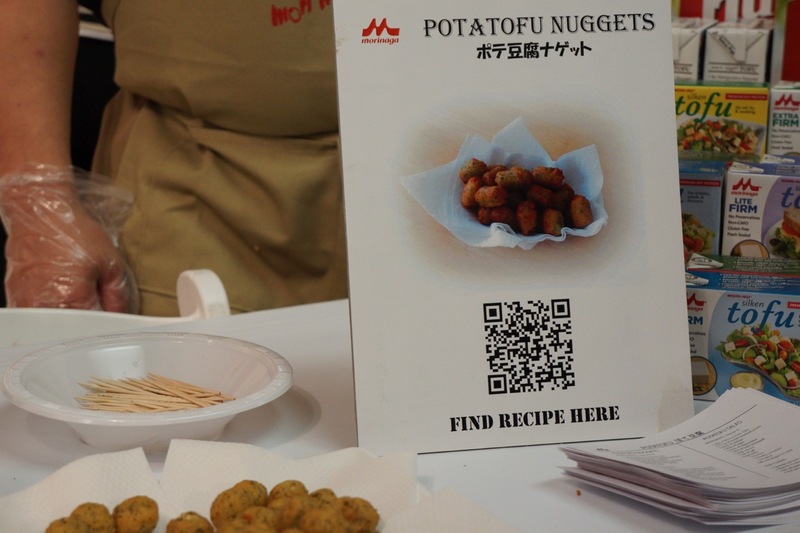 These are a few of the pleasant discoveries made at the 20th Annual Japanese Food and Restaurant Expo presented by New York Mutual Trading, Inc. on October 12. A showcase for restaurant and food service professionals, JFRE gave more than 70 vendors the opportunity to show New York the latest trends in Japanese food and drink. But the bigger message set forth by several industry people was to find an appealing New York style within traditional Japanese cuisine. Here’s a quick rundown of a few items that caught our eye. Beverages had a fair amount of booth space at the Metropolitan Pavilion, and there were some interesting twists on the way we think of sake. The big standout was Muromachi Shuzo from Okayama Prefecture. The brewery began production in 1688, and Masataka Hanafusa, whom you saw in the video, is a 15th generation brewer. In addition to the red chili pepper flavor – which Hanafusa said was the most popular of the day – they introduced a variety of sake with carrot, tomato, and honey ginger, collaborating with local farmers to break through the limitations of traditional sake. Sullivan defines “presentation sake” as a gift a politician or important businessman would give to another. Perhaps the best alcohol feature of JFRE was Shochu Discoveries, an educational taste test of Japan’s national distilled liquor. The 20-minute tour began with a video explanation of how shochu is made. Then the group went into a lab to taste three different kinds of shochu – rice, barley, and sweet potato – each paired with a Japanese appetizer. 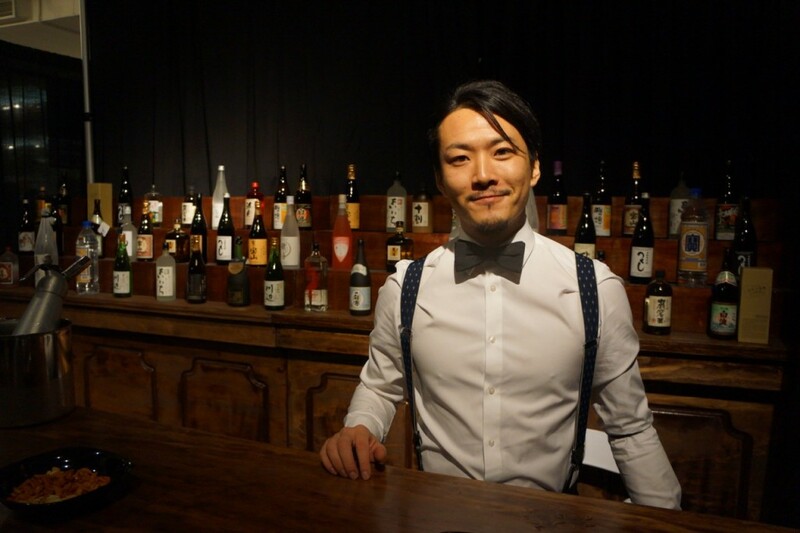 The third and final stop on the tour featured an exquisitely appointed bar with award-winning bartender Shingo Gokan of SakaMai mixing three innovative shochu cocktails. Gokan says his key to mixing the perfect shochu cocktail is to think of Western equivalents. For example, when he mixes with a sweet potato shochu, Gokan imagines ingredients that complement tequila. Gokan treats barley shochu in the same manner as whiskey, rice shochu like vodka, and sugar cane shochu like rum. There was plenty of innovation in the food department as well. 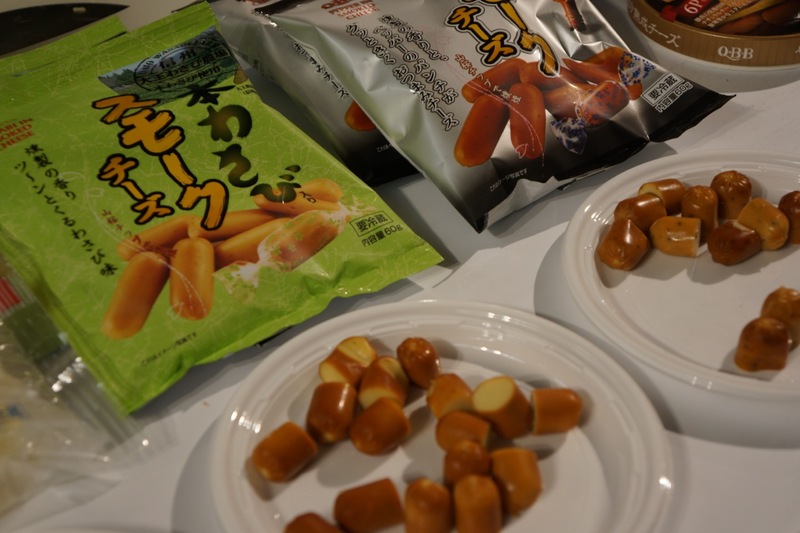 Wasabi smoked cheese – Shaped like kurobuta sausages, this cheese is smooth and creamy, and the wasabi gives it a delightful kick. Shredded yuzu – Yuzu has been a hot ingredient in New York for a while, especially with yuzu kosho. The shredded version looks like grated carrot, but has a lovely citrus flavor that adds a nice dimension to udon. Maru-yubeshi – A traditional Japanese sweet made with a yuzu peel stuffed with mochi (glutinous rice), maru-yubeshi is gaining ground as a savory item in Western cuisine. Yubeshi Souhonke Nakauraya in Ishikawa Prefecture suggests serving this unusual product with cheese and in salads. Potatofu nuggets – Oh, this is good. It’s like tater tots from the lunchroom in elementary school, but slightly healthier because it involves tofu. And instant potato flakes. Click the picture below and scan the QR code for Morinaga’s recipe. 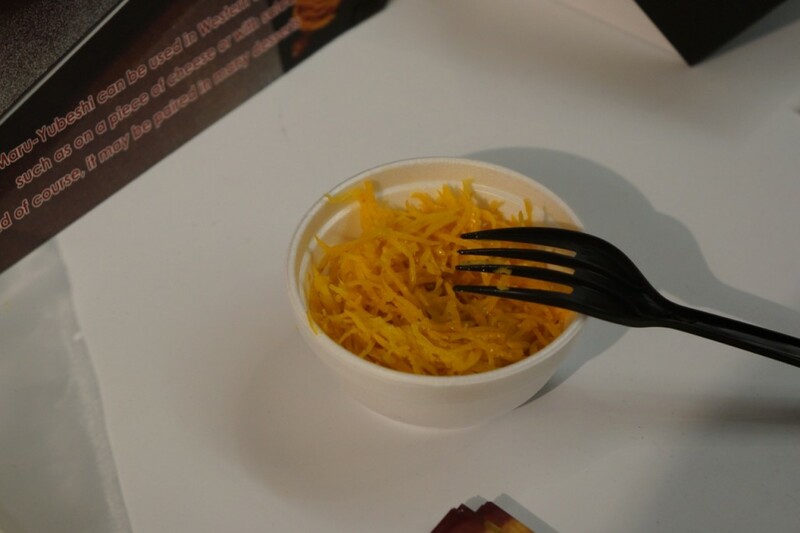 Experimenting with non-traditional ingredients while focusing on incorporating local goods – including instant potato flakes – creates exciting products that we’ll find in New York-area restaurants, supermarkets, and liquor stores in the near future. To see more photos from the Japanese Food and Restaurant Expo, please visit JC•NYC’s Flickr set.